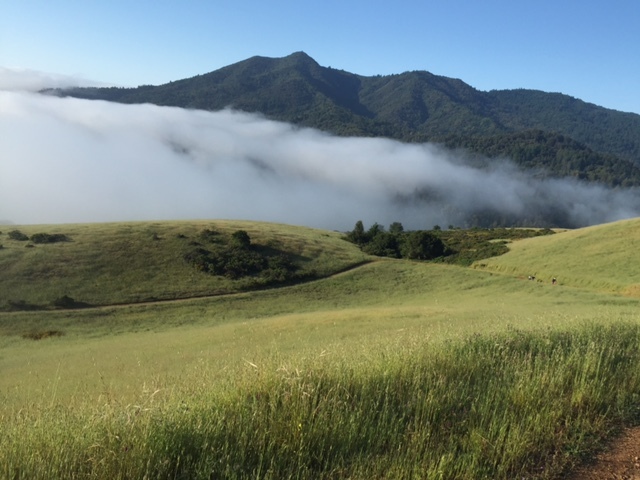 Today, under smoky skies, in 90-degree heat, I rode (alone) counter-clockwise around the Nicasio reservoir. Eighteen years ago today (Saturday of Labor Day weekend) a habitually drunken driver killed Cece Krone. And I won’t forget how the judge dealt with it all (very low bail). The ‘murderist’ (whose ten year old boy was with her) was sloppily overtaking the weekly hammer ride, and in so doing rode up the stone embankment, crushing Cece and her bike. She’d been standing by her bike inside the white line, waiting for the group. I stopped riding with that bunch long before this tragic event. Each time I went out with them I’d experience their Peloton-groupthink: if a car was overtaking, someone, sometimes more than one person, would yell “CAR BACK!” and…. nothing would change. No swift re-alignment into echelon (two by two, or even single file). Just…a big blob of spandex clad roadies, owning the whole road. If we were in Italy, the motorists would indulge. After all, it’s their national pastime, along with futbol. Here, most hills are about 3 minute climbs. Not a long time to wait until the sight line is safe. Usually I rode on the periphery of the cluster; in the gravel and weeds on the right of the white, or clinging to the yellow double line on the left. I’d call out, “MOVE!” or conversationally suggest we try to ‘skinny up’. This was back when I could talk and climb at a good clip. My suggestions fell on wind-deafened ears. Besides, everyone loves a coach, right? The one of two women in a group of ten or twenty? Right. If I didn’t enjoy riding with them, I was welcome to stop coming, and I did. Now and then my thoughts turn to statistics. After Cece was killed, a different cyclist lost his life (old, nearly blind motorist plowed into him at the shore of the reservoir), and I began leaving notes on the kitchen table. I’d never been the kind of person to leave notes or be predictable, findable, and expected back, but this felt really bad. A third, life-wrecking crash followed in 2007 when a motorist hit Blake Herod head-on as he rode his Triumph motorcycle on a clockwise tour of the reservoir. Blake, like Charlie, was a maker, and the total loss of his right arm set him back, but he took up painting and drawing with his left arm. I have not gotten Charlie to feel like doing any artwork, though his impressive drawing of a cluster of oak leaves on the branch gave me so much hope 3 months after the brain bleed. He doesn’t care to draw, though, and his Stubbornness Chakra was unaffected by the TBI. Back to the sadniversary… a perusal of today’s Marin paper, the Independent Urinal shows a slew of crashes, several DUIs, which, along with the hit-and-run of a UC Berkeley lawyer who was standing off the road, checking his phone as he was out on a ride. If you’re like me, you catastrophize. Never mind that you’ve never actually been in a car wreck (true!) or had a car hit you (my two accidents were cars turning right as I traveled–too fast, because I was late–on a road, and I assume they just ‘didn’t see me’. But the result was, I hit them in the passenger door, so I call that me hitting a car. Lame, but I am so gripped about having a ‘real’ car crash–the kind where you kiss the head-high grill of a Dodge Ram as it slaloms along through traffic. I have a bit of an anti-Dodge ram bias. I doubt many bikers survive when one of them connects with you. Oh!! OTHER GRIPE!!! Police reports that use Strange Language! “The car contacted the cyclist in the intersection”….Charlie and I used to re-write news about violent incidents a la police blotter speak: “the sheriff’s bullet contacted the victim in the back”, etc.. I need a beer. Or two. A couple days ago Cece’s ex-boyfriend Larry blew past me coming down White’s hill, and I clung to his wheel. He was going to Gestalt, and I uh…cadged a beer from him, having no gelt on me at the time (which is most of the time). Going to go to his house RIGHT NOW with a couple of Sierra Nevada pale ales, and a note apologizing for putting him on the spot at that noisy, delightful bastion of bikers hard and soft…I must repent my Old Jacquie ways. I must always travel with a tenner in my pocket. I am quite sure every one of the bikers that were involved in that painful, indelible incident are thinking of her. Every September. Like clockwork. It does get easier to bear, and riding, unsurprisingly, makes that possible. The last wombat in Mecca. Take 1. Whoah!!! Never heard of it. “Steve Miller Band” he said helpfully. He recounted how he had founded a tofu-empire called Wildwood. With my velcro memory for unpleasantness, I flashed on the acrimonious split-up, leaving impoverishment and simmering resentment. Having lived thru a similar situation torn from the pages of Capitalism’s Playbook (i.e. the canny business person will take every advantage and leave others with nothing) with Charlie, I couldn’t resist asking “are you all still friends?” And surprisingly he answered. “Which of you made out the best?” I asked devilishly. He brandished his card. It showed the logo of the very successful vegan ‘cheese’ company that adjoins the museum. He went out to his Tesla and got me a copy of his hit record, “Just Invoke the 33rd”. Gonna listen to it real soon. This evening, after driving home two miles from a musicale that happens every Thursday, I noticed Charlie got across the street by himself, despite his near blindness. I always hope he’ll get a Sense of Direction, and he must have a little bit of one, otherwise, he’d be standing by the car waiting for me to steer him across the street to our little abode. He headed straight for bed. I was still full of music, and Bonnie Simmons was on KPFA, and hell, it’s the solstice time…long days. Long years: 50 years since the 1967 summer of love. In L.A. it was happening differently–for this twelve-yr old kid, it was radio music and crushes on guys like Eric Feldman (who never stopped his infatuation with music). The house is warmish from the heat of the day. I go into the bathroom and notice the soap-dish Charlie fab’d about 10 years ago is looking ….coated with soap scum. I took a nearby brush–the writing’s nearly gone, but he’d marked it up: “Charlie’s scrubber”. Hanging above the claw-foot tub is a big 4 gallon bucket which is inscribed on the underside: “C’s nettle-gathering bucket: KEEP CLEAN”. I soak his soap dish and get it back to beautiful stainless steel with delicate wire-work to hold the soap above the surface which thoughtfully tilts into the 1936 sink. Everywhere are reminders, written notes which cry: This Is Charlie’s. Do Not Use. Now he can’t read. And I am in charge of maintenance around here. I have to use his things. I rarely rarely go in his sacred machine shop, but today the cleats on my ol Shimano shoes–at least 3 yrs old–need some attention. The work bench is a mess. I’ve left everything on it, and none of Charlie’s projects (he’d left the fork he was building for me in the central work-spot) remain. All dismantled, except the aforementioned fork which Cameron Falconer carefully completed so I could ride the bike C’d built me that summer when I was at Middlebury learning Japanese…. I’d like to thank you regular readers, first off…It was precisely a decade ago that Chris Hill plopped me down at a table to begin this WordPress blog. In those days it was free, but since about 2011 I’ve had to pay to keep ads off. It’s in vain that I protect you from ads, since the rest of your day is saturated with them, but I like to think it’s a small plus. And if the candidate has to PAY to write (like me) then….sawing wood, and dumpster diving is what she was intended for. Daily life here at our Asylum for Two is pretty nice, especially when I reflect on the trauma of so many people’s lives. The garden blooms. Charlie can take a walk on his own and usually not get lost. He can dress himself. He can eat without help. I could even leave food for him to heat..he’s not the avid vegetable chopper of yore, but he doesn’t miss that. What he misses is Touching Metal. His hands are ‘butterfingers’ (this is the too-frequent epithet he flings at his nerve-damaged digits). His feet don’t coordinate enough to skip, though I coach him on that. He can see a LITTLE BIT, but not enough to ride a bicycle alone safely (I’ve let him do it unsafely, and it’s not a good idea). We are OK, and going to Be Here Now, since that was what fate delivered in September 2015. In the last 7 months I’ve had so few chances to get out on a ride, it’s hard to call myself a biker. I never thought I was that married to the machine, and to the self-imposed role of cyclist first and foremost. The result is, that when I’m motoring about (and I do this ten times more than ever before) I see the riders out on their bikes and feel a distinct squirm of the gut. Evidence of some big cosmic gear shifting? Our dear friend and caregiver David D. reminds me that the ‘self’ is an imaginary construct, and that truly we are all part of a cosmic One. I’m very late to the sagging table of spiritual bounty, having been force-fed Catholicism at a tender age. But these days, I’m subscribing to a notion of Togetherness (with occasional additional subscriptions to a God) simply because the idea of sharing the burden is so appealing. I pray that I’ll not be ding’d for Failure to Subscribe the first 60 years. Anything at all to relax my racing mind. These days, I ride Tuesday mornings, 7 a.m. pretty regularly–before Charlie wakes up–with an early bird gang of fellows who’ve ridden for at least 35 years without fail, week after week after week. They vacation together. Many kayak together…and for the past few years, but mostly the past 7 months, they’ve embraced me as part of the Over The Hill Gang. They were ‘over’ when they were young men, artists, professionals, & bon vivants. And now they’re really over the hill, modeling muddern maturity to anyone that cares to see a weathered face, rippling calf muscles and exuberant energy. Last Saturday, a few of us convened to say goodbye to a friend and mentor who had died the previous month. Owen Mulholland (I’m leaning on him, and he’s with his twin, John Mulholland) was one of the first diehard bikies I met in Marin County. Within a year of meeting, both of our lives veered in new directions. I quit trying to pass physics classes in order to apply to medical school, and started envisioning myself as a bike racer, and he fathered a son. Emile grew into a superb human being and I managed to acquit myself in the racing. I shared one little thing with Emile: the sting of Owen’s tongue. When dancing on the podium with Liz Newberry who’d just won the national cyclocross championship (a new thing for women), Owen chastised me for unseemly behavior. But he also backed me when I needed a letter for a small grant from the Women’s Sports Foundation. And rode with me, and listened as I wept about being yet again shunned by the men’s morning ride. He was a writer, historian, father and above all a cyclist to the core. He truly lived to ride, and Emile saw to it that his close friends would be able to experience a meandery loop through Point Reyes, taking in a couple of side-trails and then climbing up the long long wooded spine of Mount Vision. I went with the dirt riders on my Croclo-Zeiss (Cunningham cross bike). There were kids in front of me and old men behind. In the middle feels comfortable now. The ride was just hard enough for me to feel worked, under the forest canopy which the Japanese know is so healthful. Road riders convened with the dirt riders and we shared stories. Franklin Blackford (the fourth person in the above picture) spoke of how he was embraced by Owen and his men’s Wednesday riding group within months of moving here. Believe me, it’s rare. Our county doesn’t have a warm fuzzy exterior, but there are people within that reach out and grab you. After the ride, John Mulholland approached me with a smile and announced I was wearing his Pedal y Fibra jersey from 1963, when he raced in Mexico. I was flattered, and wondered how it ended up with Charlie Kelly. It was C.K. who gave it to me (well, he was throwing it away, actually, and I caught it mid-throw), and who swore it was from someone in the Grateful Dead crew. A very patched up 5 pocket work of sartorial art, I am keeping and wearing this thing til it’s in shreds. It’s only fitting.